Overview. Weave your way with us along the St. Kevin´s Road to Glendalough, walking in the footsteps of our ancestors and connecting with the awe-inspiring beauty of Wicklow´s sacred landscape. As you meet new friends and enjoy stretches of silence and mindful walking, fall into rhythm with the natural world and find a joyful sense of peace. Short stops along the way will provide some background about the Road and St. Kevin´s life and moments of reflection. St. Kevin´s Road is on the doorstep of Dublin and a great day out for all the family. Suitability. Easy to medium-difficulty trail following well maintained forest tracks with one hill leading up to the Wicklow gap. Some areas are quite boggy, so be sure to bring waterproof shoes. Bring also packed lunch, water, sun-screen (if optimistic), wet-gear (if realisticJ), an open heart and an intention for the walk. Getting there. We will meet in Glendalough visitor centre car-park at 10.00 a.m. Glendalough is signposted off the N11 from Dublin. A bus will drop us to Ballinagee Bridge, where we will begin our walk. Time. About 3 hours. People can walk at their own pace or walk in a group with leaders. 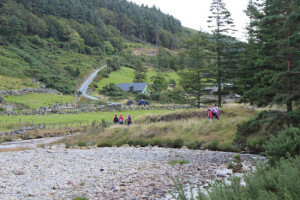 Anyone who would like a shorter walk can take St. Kevin´s Road from the monastic city of Glendalough, past ´God´s cottage and walk up towards the Mining Village. Contribution required from Participants: €5 per person for the bus to the starting point (or feel free to arrange your own transport if you would prefer). Walk Start time. 10.00 at Glendalough visitor centre car-park. Please contact Niamh on 087 9185143 or nnidhonaill@gmail.com to book a place and visit www.facebook.com/GlendaloughPilgrimage for more information.